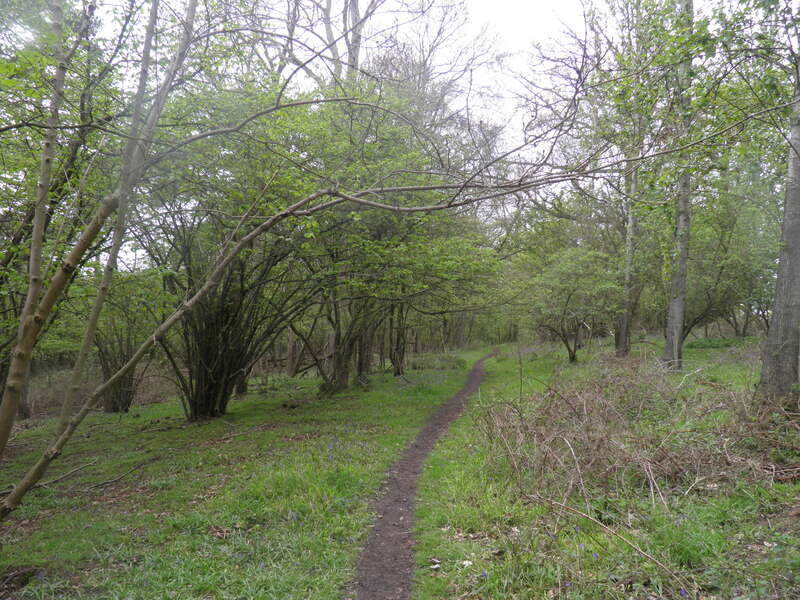 A taste of the northern end of sylvan Epping Forest, followed by a hike through the quiet, little-known fertile uplands of the North Weald, descending to the wildlife-filled reservoirs of the Lee Valley. 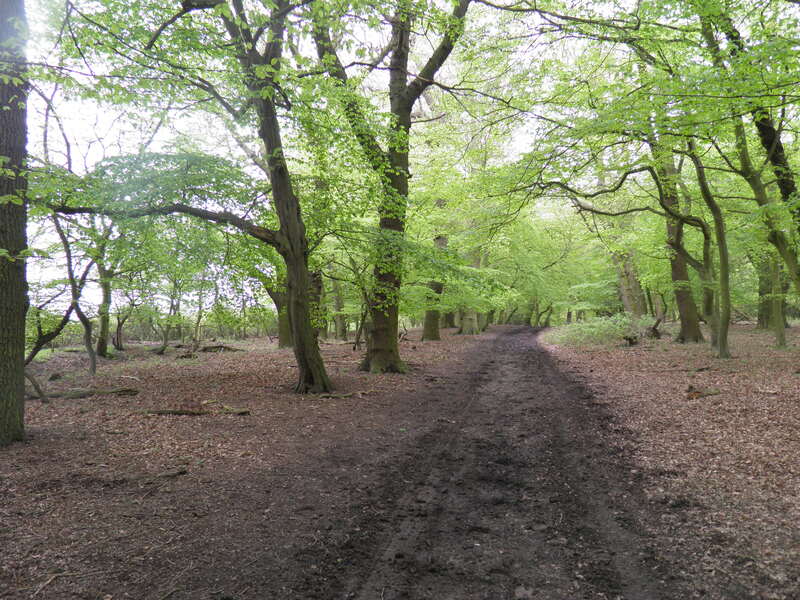 Underfoot: Whilst most of this walk is on well-surfaced paths or well-drained upland fields, you will encounter mud except in the driest conditions – in particular, on the first stretch out of Epping and on the long bridleway beyond Bumble’s Green. Good footwear essential. Terrain: Plenty of ascents and descents throughout the walk, including a long drop into and climb out of the valley of Cobbin’s Brook. However, the gradients are almost all gentle. 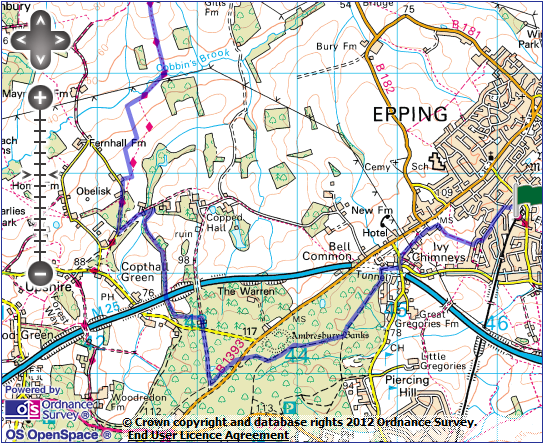 Maps: 1:50,000 Landranger 167 Chelmsford; 1:25,000 Explorer 174 Epping Forest & Lee Valley. Getting there: Epping is the last station on its branch of the London Underground Central Line, with trains at least every 10 minutes from central London. Journey time from Oxford Circus is around 47mins. Trains run via Stratford for Jubilee, DLR and mainline connections (27 mins). 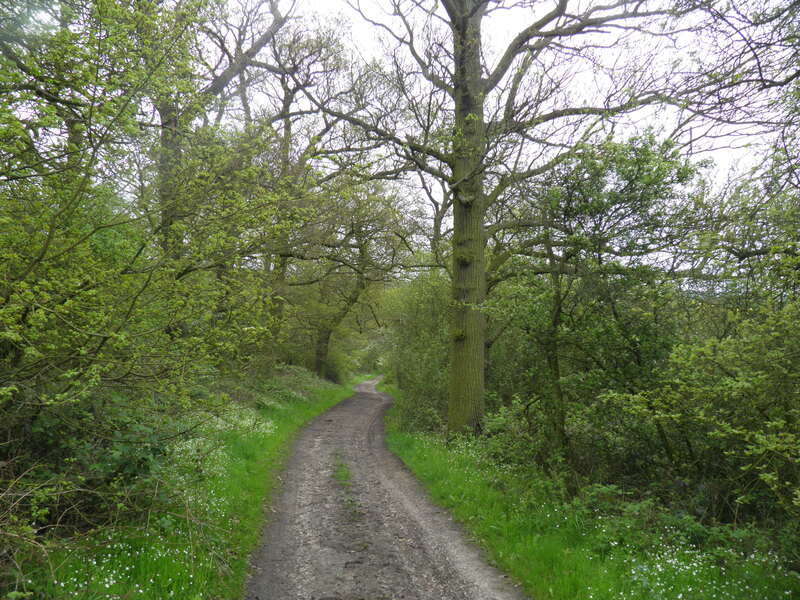 Useful websites: The walk follows parts of the Forest Way. 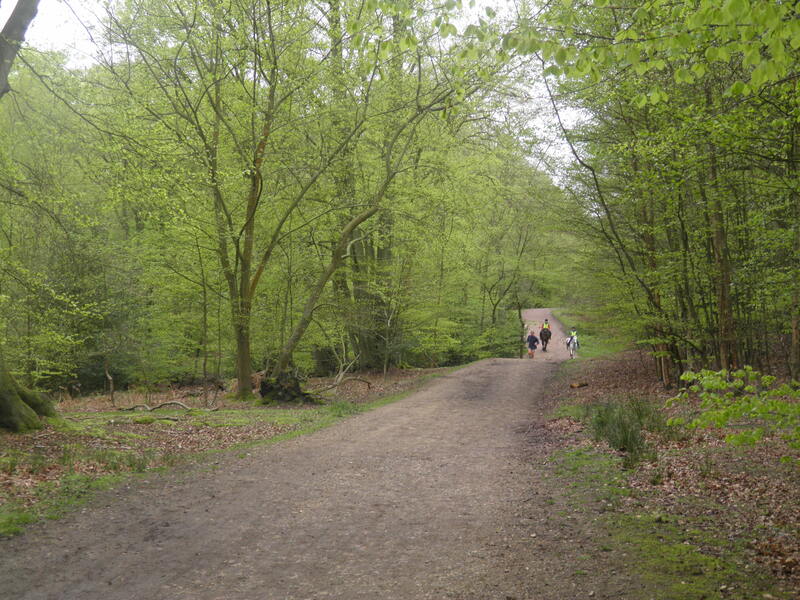 The route passes through parts of Epping Forest and the Lee Valley Park. Getting home: Cheshunt has 6 Greater Anglia services an hour (3 per hour on Sundays) to London Liverpool Street (23-33 mins), almost all of which call at either Tottenham Hale or Seven Sisters (9-18 mins) for Victoria line connections. There are also 2 trains per hour (1 per hour on Sundays) to Stratford (26 mins), also calling at Tottenham Hale. Fares: It is likely to be cheapest to buy separate tickets for the out and back journeys. Using pay-as-you-go on an Oyster card, a Zone 1 to Epping journey will cost £2.90 off-peak (free for under 10s, 70p for 11-15 with appropriate Oyster card). Without an Oyster card, a cash single is £5.30. To return, simply buy a Cheshunt to London single for £6.70 (£3.35 child, £4.45 railcard). road. Very soon, you cross and take the fenced tarmac path next to the entrance of the station car park. 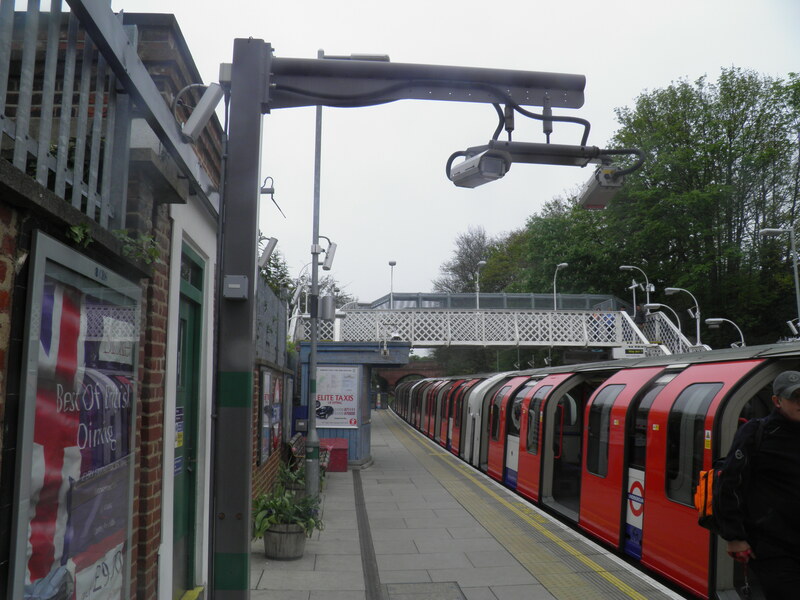 If Epping station doesn’t look like a traditional Tube station, that is because it began its life as a stop on the mainline Eastern Railways route from Stratford to Ongar, opened in 1865. The line was not electrified and transferred to Underground operation until 1949, with the existing stations retained. Epping became the terminus in 1994, when London Underground closed the little-used line beyond to Ongar, stating it would be cheaper to buy all its users a Rolls Royce than to continue operation. Needless to say, no Rolls Royces were provided. Continue up the concrete steps to join a residential road, turning left. Keep to this road over the brow of hill, a little beyond the summit turning right onto Western Avenue. Just after the curve to the left, turn right at a public footpath sign. Follow the clear, straight path – sometimes muddy – through a series of rises and dips. At a T-junction at the top of a rise veer right along the edge of a field, passing through a gap in the hedge next to a bench to reach a small road on Bell Common. 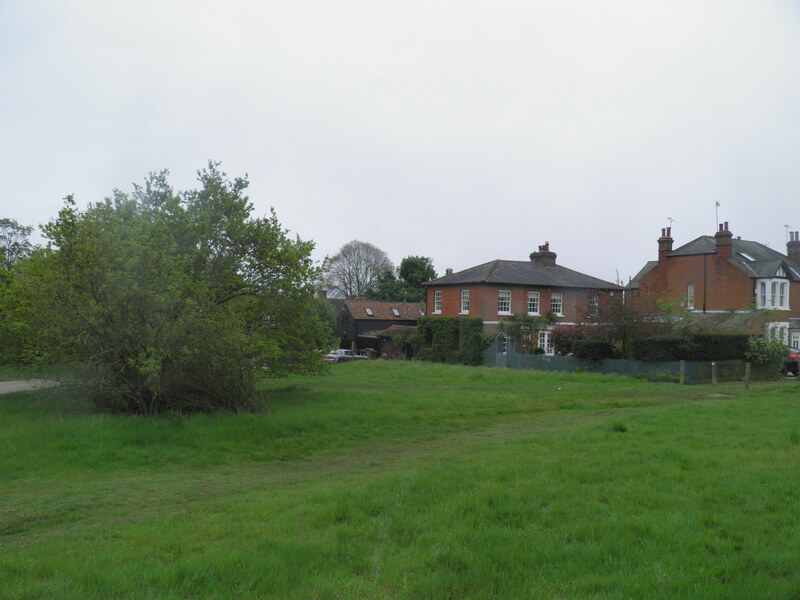 Bell Common is an attractive conservation area, no longer managed as a common, but being taken over by scrubs and trees. It was historically called Beacon Common and it has been suggested that the settlement here was originally established to maintain a warning beacon. Cross the road and walk between posts to join an unsurfaced road along the row of houses bordering common, a pleasant mixture of new and old cottages. Continue straight ahead where the road becomes tarmaced. At a road junction by Forest Gate Inn continue straight ahead on a larger road. Forest Gate Inn refers to the toll gate that once stood nearby on the High Road, an 18th century turnpike cutting straight through the forest to link Epping with London. Just after the junction with Ivy Chimneys Road, turn right between posts through a clearing in the woods (this clearing is in fact the roof of a tunnel on the M25). Just before reaching the edge of a cricket pitch, veer left on a clear path heading into the trees of Epping Forest. recreation area on the edge of the conurbation for well over a century. Almost 19km long on a north-south axis, this ancient woodland was a royal hunting forest from the 12th century, until being placed in the hands of the Corporation of London in 1878 to maintain for public access and enjoyment, preventing enclosure and halting the shrinkage of the forest. This soon joins a broader, firmer path dropping gently downhill. You cut across two small valleys and at the top of the rise out of the second, arrive at a large path junction. Here veer right, keeping to the broad, surfaced path. You pass the earthworks at Ambresbury Banks, with an information board, on the right. Ambresbury Banks represent the remains of an iron age hill fort, the single ring of banks enclosing an area of 11 acres. It is believed to have been inhabited from some point in the 8th century BC until around 42AD, and is thought to have been part of a line of forts delineating the terriories of the Trinovantes and Catuvellauni tribes. 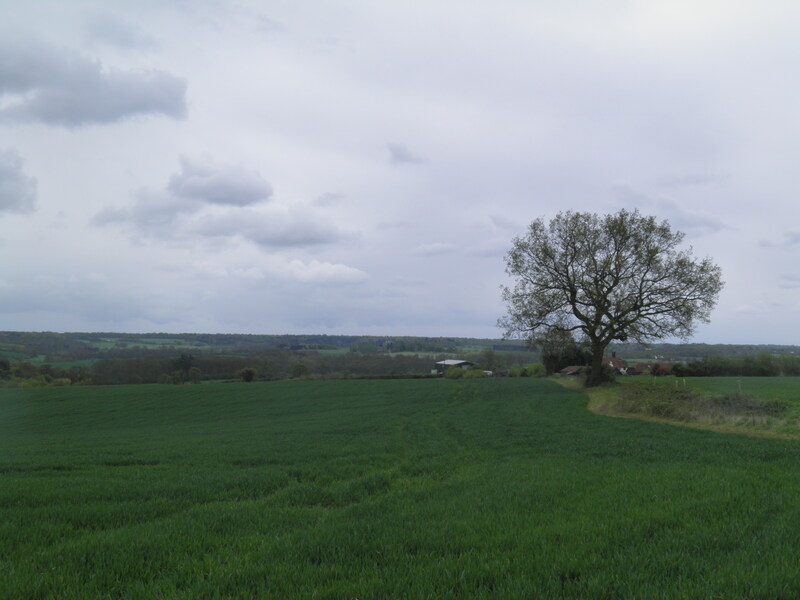 Legend has it that this was the site of Boudica’s last stand against the Romans, but there is no evidence to support this. 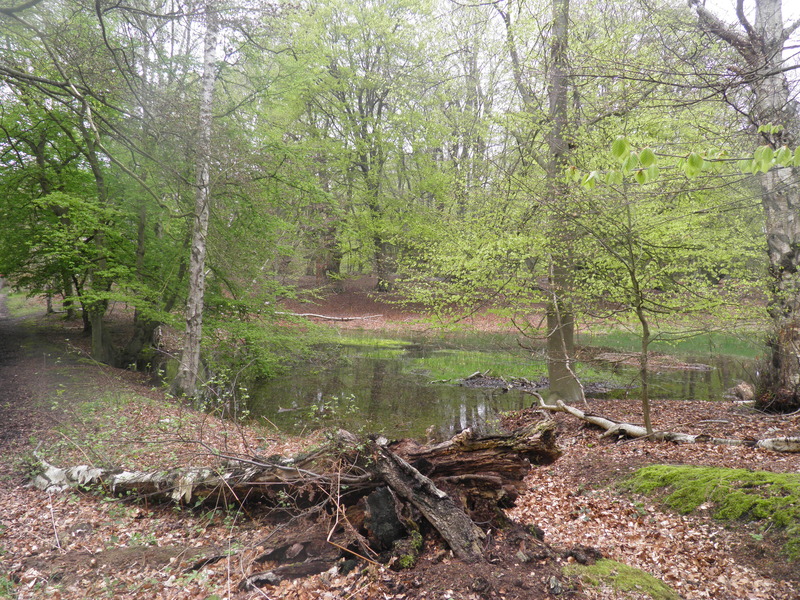 About 400m beyond, where the woods thin out, you reach a path junction on the edge of a patch of open heathland. Turn right here on a clear path. This soon brings you to the busy B1393. Cross with care and take the clear path opposite, which immediately curves left to parallel the road. On reaching a small crossing road, turn right along it to a small car park. Pass the earth barrier which blocks the road to cars beyond this point and continue ahead on the former road, now effectively a narrow tarmac path through the woods, passing several attractive ponds. 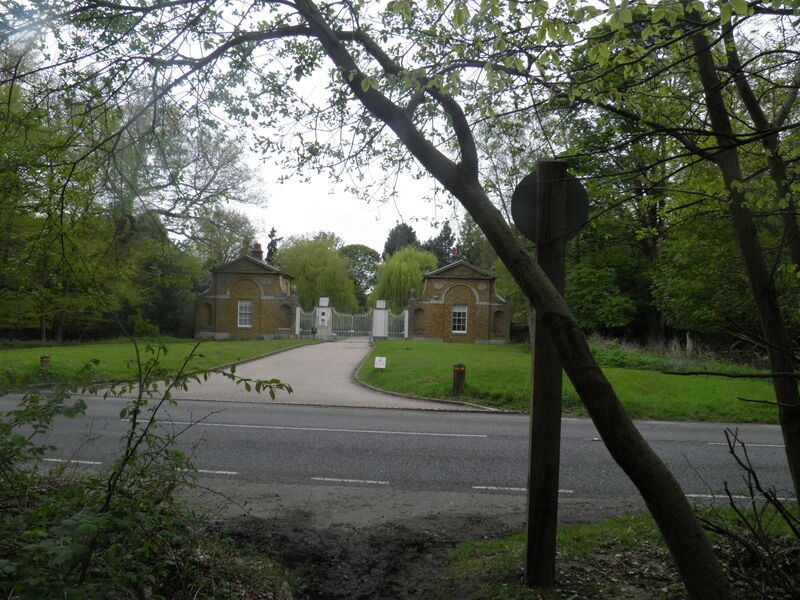 Eventually reaching a road, cross and pass through the foot gate next to Copped Hall Park’s lodge houses ahead. Just after the gates, by an information board, turn left on a footpath (signed to Lodge Farm) through the rhododendron bushes. Copped Hall is a ruined 18th century mansion, set in a huge area of parkland now split in two by the M25 orbital motorway. The Georgian mansion, which you will glimpse later, replaced a 16th century house, visited on at least one occasion by Elizabeth I. The house was gutted by fire in 1917, probably caused by discarded cigarettes when the inhabitants gathered on the roof to watch a Zeppelin being destroyed over Grays. Like Epping Forest, the house and park are now in the hands of the Corporation of London, and a trust is slowly rebuilding the Hall. Keep to the waymarked path as it swings right through younger woodland towards the M25, then passing through a long tunnel under the motorway. At the path junction immediately beyond the M25, keep right, climbing the bank beside the motorway. Just before a stile turn left on a clear path (there is no waymark at the junction) along the centre of a narrow wooded strip. The path winds along this pleasant strip – full of bluebells in the spring – for about 1km, eventually coming alongside a stream. As you approach a cottage, you get a brief glimpse of the tall chimneys of Copped Hall on the hill to the right. At a track, turn left (signed to Copthall Green) past pretty Lodge Farm. On reaching a minor road, turn right along it across the wooded common. waymark). The right of way officially cuts across the field but it is easier to take the track to the left along the field edge. 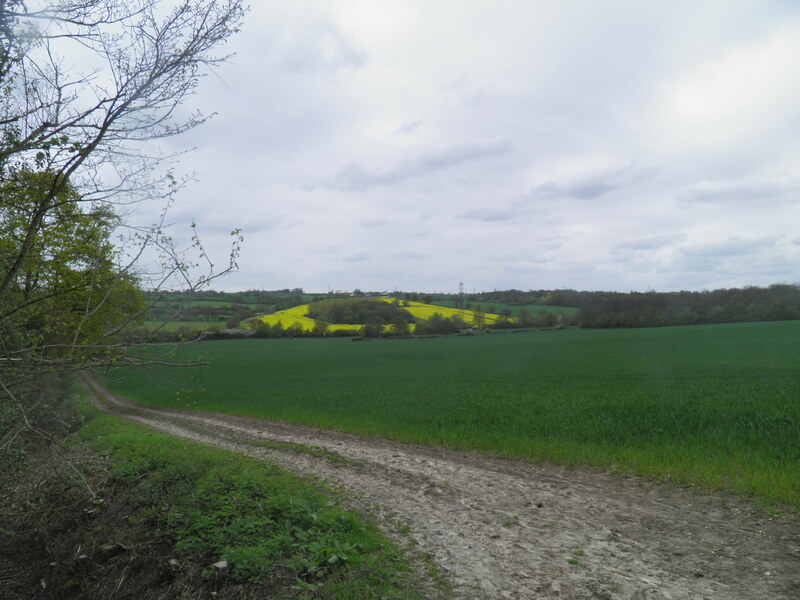 As you follow the track, a fine panorama of rolling, fertile fields separated by dense hedgerows opens up ahead. Keep to the track as it twists around field edges down into quiet valley of Cobbin’s Brook. On reaching the stream, follow track R alongside it. Coming alongside Spratt’s Hedgerow Wood on the right, follow the track left over the stream. Immediately after the bridge, turn left off the main track to follow the faint path along the side of the hedgerow, gently climbing. There are waymarks here, but they are rather hidden in the hedge. of north east London. Pass to the left of a large modern barn and exit, just to the right of a double gate, onto the small road by Parvills Farm. Cross the road and take the footpath opposite (following the Forest Way waymark). Still climbing gently, keep beside the left hand hedgerow, again ignoring the course of the right of way shown on the map. 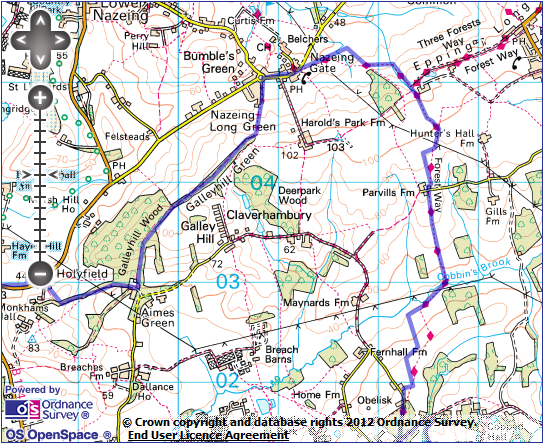 At a junction of fields follow the path right to a pylon and from there left, climbing again and now back on the right of way route shown on map. hedge to join a broad grassy path running between the two hedges to your left. 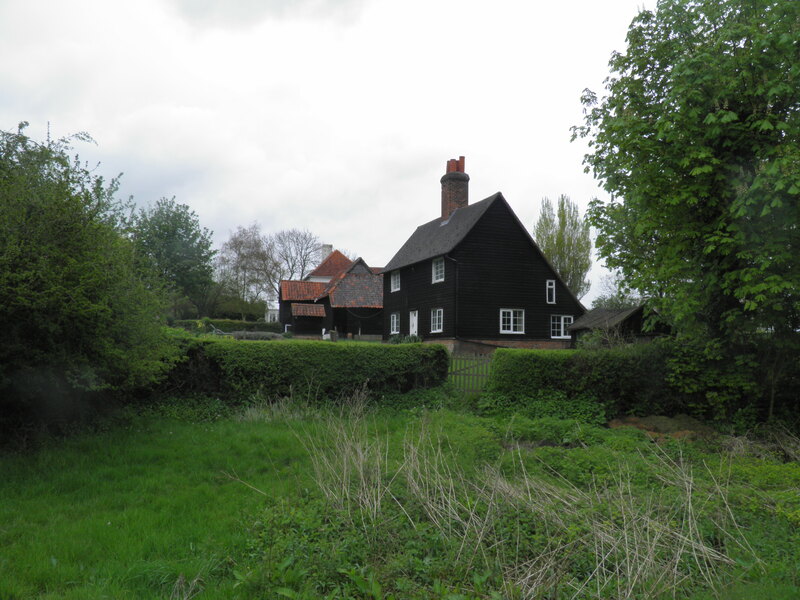 Emerge by beautiful group of weatherboarded cottages (at the end of Epping Long Green) into a small field festooned with footpath signs. Follow the waymark straight ahead through the hedge, doglegging left then right to follow a small stream gently downhill, emerging onto the vast fields of Nazeingwood Common. Continue beside stream, with views west over the Lee Valley, before turning left over a footbridge. 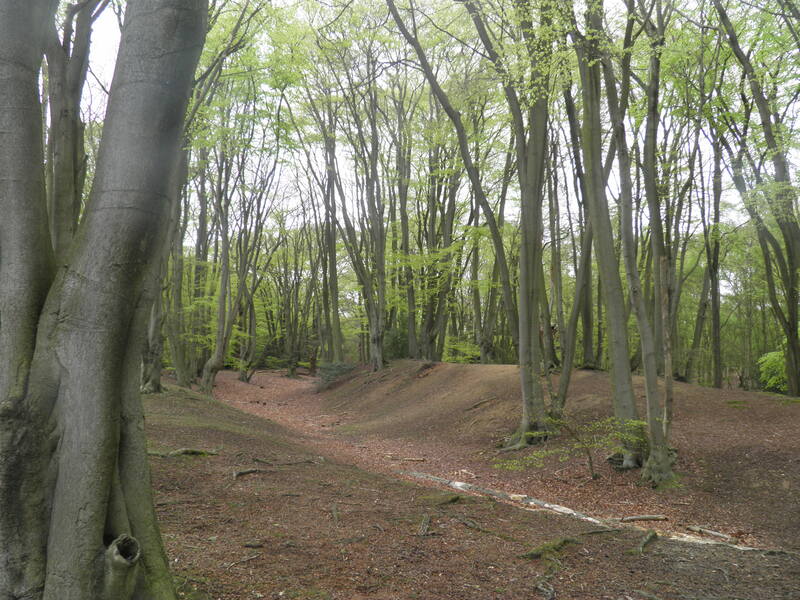 Nazeingwood Common is a large bowl-shaped plateau, originally part of the no longer existing (except in the name of a London borough) Waltham Forest. Cleared for grazing in the 13th century, it was ploughed up for crops during World War II and remains as arable land today. 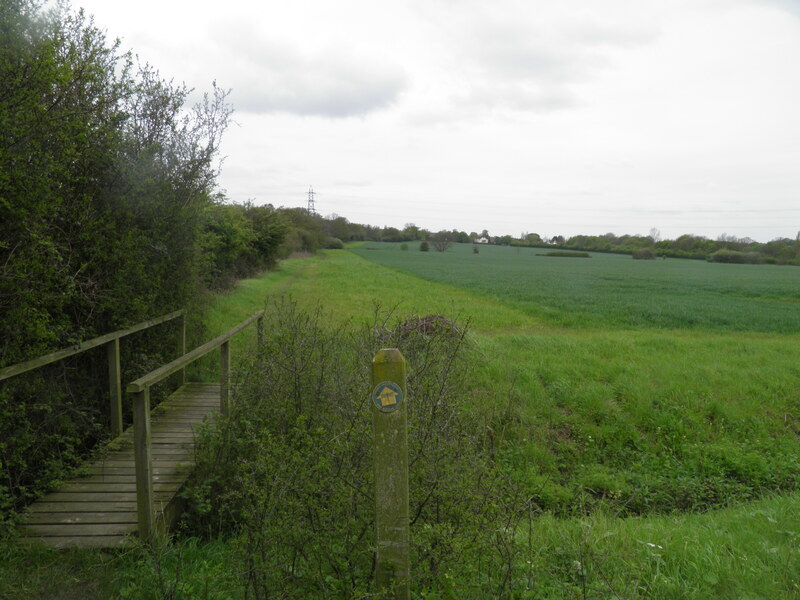 At the next hedgerow, turn right on a track (following a Stort Valley Way waymark). Where the track swings right, follow the Stort Valley Way left over a footbridge and across fields towards the houses ahead at Bumble’s Green. Emerge onto a road opposite the 18th century King Harold’s Head pub. Turn left along the pavement through the mainly modern village. At a roundabout, turn left on little Bumbles Green Lane (marked with a byway sign). At the end of the houses, continue straight ahead on a climbing track (past a no cars sign). At the top of the hill, pass the Corporation of London sign and swing right, following a bridleway sign. Note the coal tax post in the undergrowth to the left just before the sign. Coal tax posts mark the point at which the historic duty on coal being brought into the City of London became payable to the Corporation. There are around 210 markers – with the cast iron post as seen here being the most common type – placed in an irregular ring between 12 and 18 miles form the centre of the City, even on the most obscure byways (as here!). When first levied in 1666, the duties were meant to support the rebuilding – particularly of St Paul’s Cathedral – after the Great Fire. They were subsequently used for more general infrastructure projects until they were abolished with the formation of the London County Council in 1889. Follow this broad path along the hilltop wooded strip – mainly very pleasant, though stretches will be very muddy after rain. You may, particularly as you pass over Galley Hill, disturb the large herd of deer that inhabit these woods. cottages and light industrial units. Joining a broad track, you turn right, keeping straight ahead at a junction by a modern semi-detached house. Keep to this track – known as Puck Lane – through a barrier and eventually climbing to a low ridge. At the top, the clear track ends and you descend on a faint path between hedges to join Chestnut Farm’s track. Turning right here brings you to the busy, narrow B194. Cross the road with care and turn left along it. Luckily, after about 50m you can cut right over a small footbridge (footpath sign) on a permissive path which runs behind a cottage and then parallel to the road, descending towards the Lee Valley ahead. Just before a row of bungalows, cut left at a signpost back to the road, turning right along the pavement. At the corner ahead, turn right on Stubbins Hall Lane. park), entering the Lee Valley Park. Where the road curves right, head left on a path between posts to reach a substantial footbridge over Horsemill Stream. 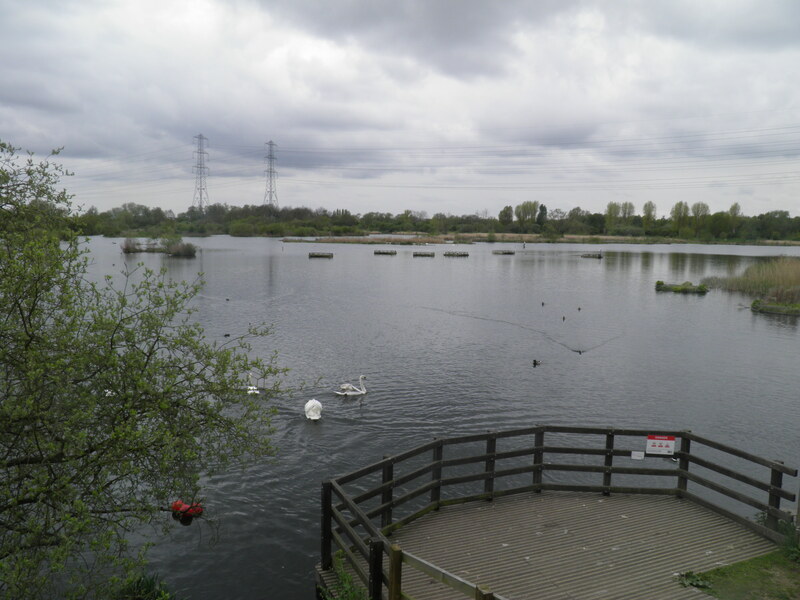 Once across, you are immediately met by a panorama of one of the huge number of reservoirs in the Lee valley, likely to be teeming with bird life. The Lee Valley Park is a 26 mile long linear park stretching from Hackney to Hoddesdon, around 5 miles north of this point. This covers not just the banks of the river itself, but also its numerous overflow channels (such as Horsemill Stream), and the large number of lakes and reservoirs. 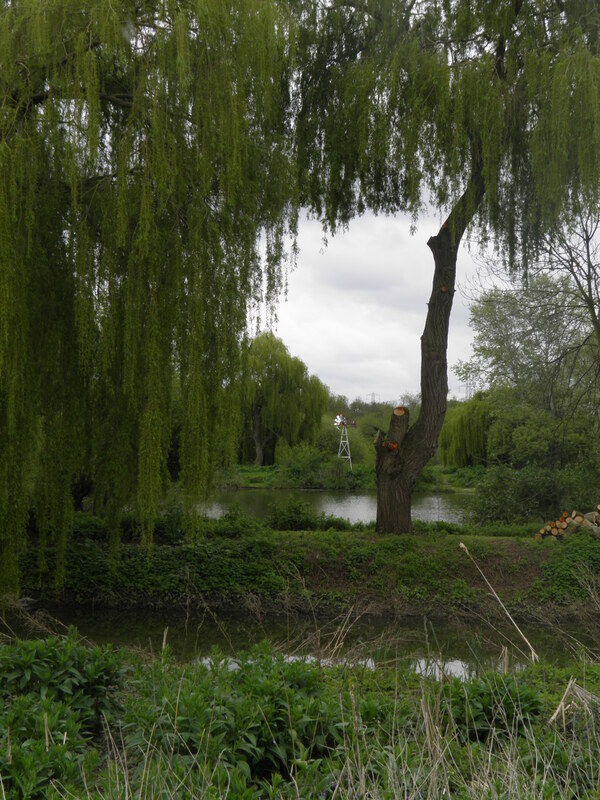 The Lee Valley Regional Park Authority, which maintains the park, is funded by – amongst other things – a small precept on the council tax bill of every London borough, so if you are London resident, you have helped support the landscape you see here! Turn left on the tarmac path (signed to Waltham Abbey). The path follows the narrow, meandering strip of land between reservoir and river, with fine views of the wildlife on both. On reaching a small car park, pass through it and take the right hand road at the end, leading onto a path which climbs to a high footbridge across the lake. Beyond the bridge, the path wanders through the woods, along the shores of the lake. At a junction, keep straight ahead to cross a bridge over the Lee Navigation. Descend right to the towpath and turn right again (signed to Cheshunt and Waltham Abbey). The Lee here is a canalised river, with navigation possible from the Thames at Bow right up to Hertford, around 10 miles upstream of here. Efforts to improve the navigability of the Lee began as early as the 15th century, with improvements such as locks and cut-offs continuing to be added well into the 19th century. As late as the 1950s, horse-drawn commercial barges were operating right through to Hertford, but since the 1980s there has been little if any commercial traffic. 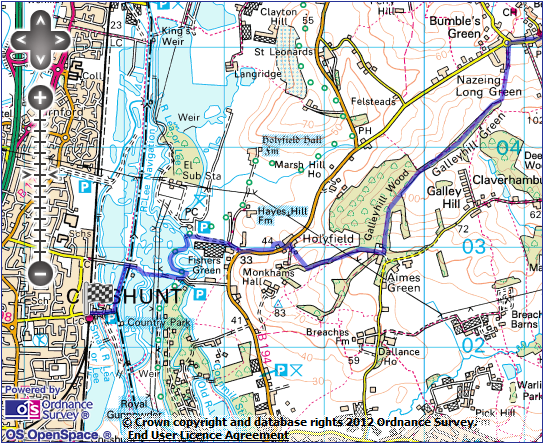 Navigation curves slightly to the left, take a path right (signed to Cheshunt), passing through a car park. Keep straight ahead on the road over the Small River Lea and a level crossing. Cheshunt station is on the left immediately after the crossing. Fantastic walk, thanks so much. Thank you for this website. It is a wonderful resource. I just wanted to let other walkers know that the path next to the B194 is not easy to reach due to seriously overgrown nettles and brambles blocking the footbridge. Further afield, the bridge across the lake is closed to traffic until the 26th of June 2017. 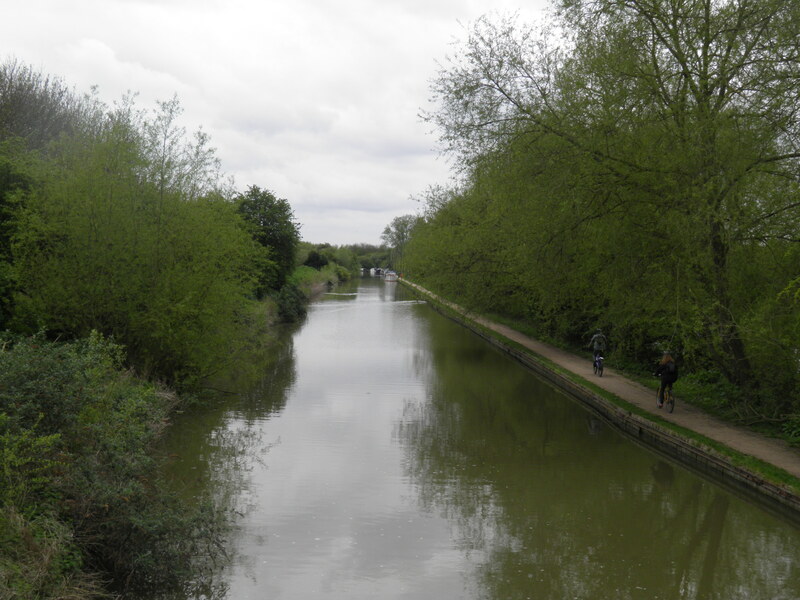 However, a slightly longer path wich leads to the Lee Navigation can easily be taken instead. Access to the path next to the B194 is more difficult. Footbridge and stiles, both to get in and out of the field have been removed. Access now requires a little scramble across the ditch and climbing the fence. Eminently doable, but a pain, and necessary, as that stretch of road would be treacherous to walk along. Sadly the footbridge and stiles that were there, but overgrown with brambles when I originally did this walk back in 2014, are now completely removed. I didn’t jump the fence in / out of the field, but jogged the 400m along the road. There is space to stand on the verge when cars are coming, but they’re often travelling fast, so it’s not ideal, but it’s certainly do-able. Outside of Epping Forest and the Lea Valley Park, I hardly saw anyone other than a couple of dog-walkers and this was a hot Easter Sunday! I saw a lot more deer this year. I spotted a herd of almost x 20 just north of Cobbins Brook and had a couple more sightings on Galley Hill [where we scared each other, suddenly appearing within a few metres of each other!] and Galley Hill Wood. Great walk, thank you very much for posting!